THE HEREKE RUG - Made exclusively for royalty and heads of state. Nestled in Turkey's Izmit Bay, on a gentle slope overlooking the Mediterranean Sea, the village of Hereke is the sort of story-book old town one sees traveling Turkey's historic northern coast. Just 35 miles east of Istanbul, it was once home to the Ottoman court’s official rug-making workshop, where in the 19th century it produced the finest rugs in the world. In the beginning, the carpets were made exclusively for royalty and heads of state, and while Hereke carpets made today are available on the wider market, the singular quality of their historic beginnings can be found in their commanding size and density. Rarely can we trace the origins of a Turkish rug so precisely as those of the Hereke, but here the records are impeccable. In 1841, seeking to build a textile workshop to furnish his palace in Instanbul, the Ottoman sultan Abulmecid I chose Hereke for the location of his Imperial Manufacture. The workshop was founded to manufacture all textiles for the Sultan’s home, and to this end artists and weavers from across the country were gathered to begin large-scale production immediately. The factory did not produce only rugs; curtains, upholstery, and fabrics were all made for exclusive use in the Ottoman court. Finishing the palace with aplomb, the workshop was an enormous success, and over the next century Hereke Imperial Manufacture continued to build its reputation as one of the finest carpet-making centers in the world. Decades would pass before Hereke rugs were available to the public. 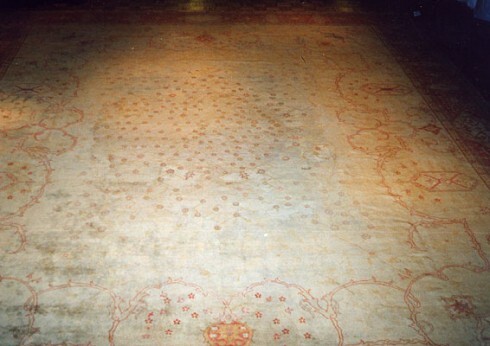 Manufactured exclusively for state use, the carpets featured prominently as Ottoman gifts, as sultans presented the extraordinary Hereke rugs to visiting statesmen and noblemen. Hereke rugs were presented to the royal families of Germany, England, Russia, and Japan among others, who in turn displayed the rugs prominently in their homes and public spaces. Word of the Ottoman carpets spread, and in this way, slowly growing an international reputation, the Hereke carpets came to be known as some of the finest in the world. 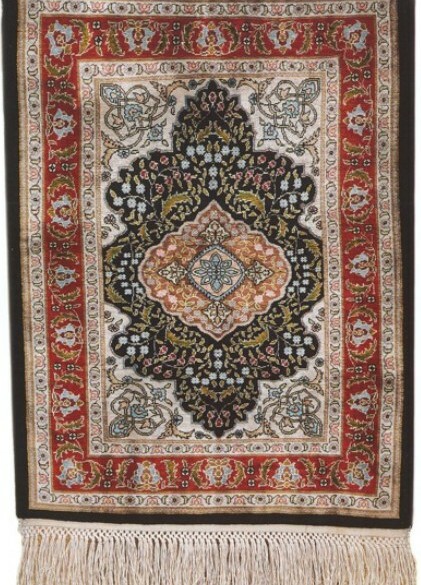 By the late 19th century production had increased significantly, and finally, in 1890, permission was granted to select traders in Istanbul to sell the rugs at market. Conceived for the grand homes of sultans, statesmen, and noblemen, Hereke carpets have traditionally been palace-sized rugs. For their patterns, Hereke weavers did not draw on traditional Turkish design, but instead looked to Persia for the elegant floral and geometric motifs that were most fashionable in the 19th century. Despite their enormous size, the carpets have always been hand-made using the Turkish double knot, and they are well-known for having extremely high knot densities. Many examples of Hereke silk carpets have in excess of a million knots per square meter, combining silk, wool, cotton, and camel hair yarns in intricate combination. In many examples, finer details in the pattern are accented with gold and silver threads. Though the original Hereke Imperial Manufacture had a great run, lasting decades, the town at the center of the Ottoman textile industry could not fight the tides of history. When the Ottoman Empire collapsed after World War I, production of Hereke carpets ceased completely for decades. Antiques would generate massive interest on the international market, but despite demand, Hereke was unable to begin production anew. It wasn’t until the middle of the 20th century when a group of Hereke weavers gathered to successfully revive their town’s dormant tradition. Today they are some of the most popular carpets in Turkey, strictly regulated to maintain the high style of their forebears.